The Comoros, officially the Union of the Comoros is an island nation in the Indian Ocean, located off the eastern coast of Africa, on the northern end of the Mozambique Channel, between northern Madagascar and northeastern Mozambique. The nearest countries to the Comoros are Mozambique, Tanzania, Madagascar, and the Seychelles. Comoros has endured more than 20 coups or attempted coups since gaining independence from France in 1975. In 1997, the islands of Anjouan and Moheli declared independence from Comoros. In 1999, military chief Col. AZALI seized power in a bloodless coup, and helped negotiate the 2000 Fomboni Accords power-sharing agreement in which the federal presidency rotates among the three islands, and each island maintains its own local government. AZALI won the 2002 Presidential election, and each island in the archipelago elected its own president. AZALI stepped down in 2006 and President SAMBI was elected to office. In 2007, BACAR effected Anjouan's de-facto secession from the Union, refusing to step down in favor of fresh Anjouanais elections when Comoros' other islands held legitimate elections in July. The African Union (AU) initially attempted to resolve the political crisis by applying sanctions and a naval blockade on Anjouan, but in March 2008, AU and Comoran soldiers seized the island. The move was generally welcomed by the island's inhabitants. For silver and base metal coins of Comoros, please look at our original Chard Coins website. 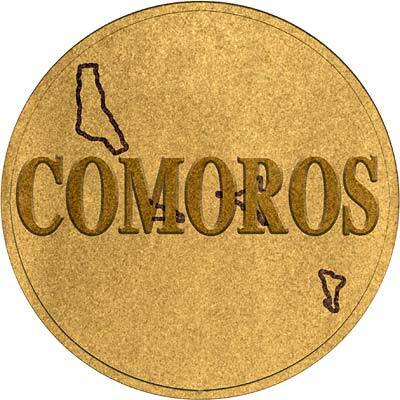 We make an active market in almost all world coins, gold or otherwise, including Comoros gold coins. If you have any of these coins to sell, please contact us, or post them to us for appraisal and offer.